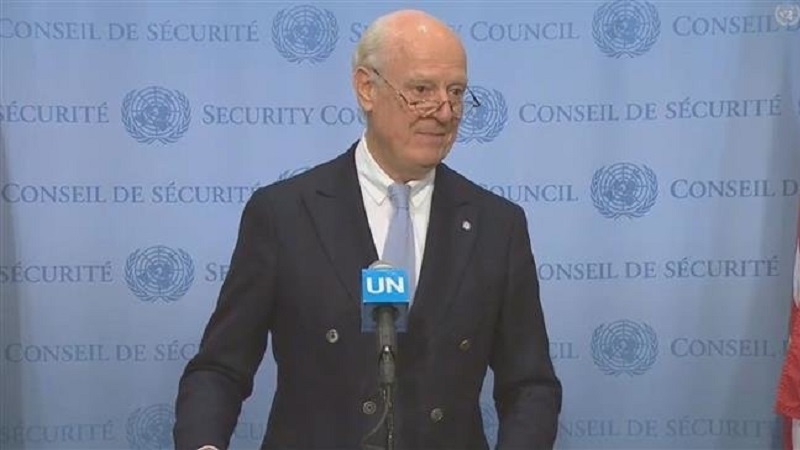 The UN Special Envoy for Syria Staffan de Mistura has announced that he would resign at the end of November for “family” reasons. Being appointed to the position in July 2014, the Italian-Swedish diplomat would be the third envoy after late UN Secretary General Kofi Annan and Algerian diplomat Lakhdar Brahimi to leave his job. The UN-backed peace process in Syria, dubbed as Geneva talks, are the longest-running attempt at peacemaking in the Arab country by the mediators that have been convened eight times with no significant progress. According to the UN diplomats, UN Envoy for Iraq Jan Kubic, former Algerian Foreign Minister Ramtane Lamamra, UN Middle East envoy Nickolay Mladenov and Norway’s Ambassador to China Geir Pedersen are possible replacements for de Mistura. De Mistura further noted that he would do all his efforts to form a credible committee to draft a new constitution for the war-torn country. He said there is an agreement on a 50-member government and opposition delegation, but the Syrian government has some objections, adding that he would visit Damascus next week to win the government’s approval. “In order for the process to be trustworthy, then there has to be the agreement of all parties and that takes time. So we need to be patient,” Nebenzia said. Syrian UN Ambassador Bashar Ja’afari also said that his government is committed to forming a constitutional panel.